As a senior trainer in the management team of the Andreas Hermes Academy (AHA) of the training organization of German agriculture, Uli Ernst has been traveling to East Africa about three times a year for five years. In Ethiopia and Uganda, he coaches local coaching teams with the Society for International Cooperation: the goal is to build up networks for the exchange of experience among farmers, such as a Ugandan rural youth. “In contrast to the practitioners, I can not do much wrong,” says Ernst, “I’m just teaching knowledge.” But from no job, he comes back as exhausted as from the two-week overseas missions. Especially when he undertakes a development-policy study trip with 18 young Germans from colleges and academies every two years , taking responsibility for them. In Ethiopia Ernst has 70 million colleagues, 250 times as many as in Germany – and the number does not go down, but continues to grow rapidly. “On average, there were three children left at each farm handover, who are then unemployed and unemployed,” says Ernst. The chances of young women are particularly bad. On top of that, he volunteers for them: he supports Ethiopian agricultural students in becoming beekeepers. In a project of the AHA with the German beekeeper for beekeepers association they prove three-month courses. The women learn how to harvest honey without chasing off the bee colony. With gentle harvesting methods, the beekeepers can take up to 20 pounds instead of a poundHarvest kilos of honey and multiply the peoples if necessary. Honey is of enormous importance in Ethiopia and is one of the world’s ten largest producers. 55,000 tonnes of honey are produced there every year , but the potential is estimated to be ten times as high: around 30 million farmers run small apiaries with up to three beehives. And the market in their own country is considerable – if only three-quarters of the production to the popular honey wine “Tej” is refined. The second national drink imports Ernst from the only Ethiopian roasting company that meets European tastes. At the cafeteria on the labyrinth 50 cents per cup flow into the beekeeping project. 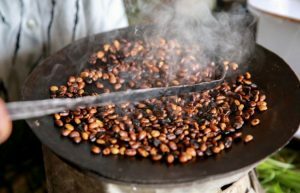 Although the Kaffar region in southwestern Ethiopia is the origin of Coffea arabica and the shrub still grows wild there, only a tiny part of the value added remains in the country: 30 cents for a kilo get there a farmer. In this country could earn up to 200 euros in the restaurant.